My dad always mentioned to me a certain place near 独立桥, and I stopped to ponder for a short while – where is this 独立桥..or Merdeka Bridge. 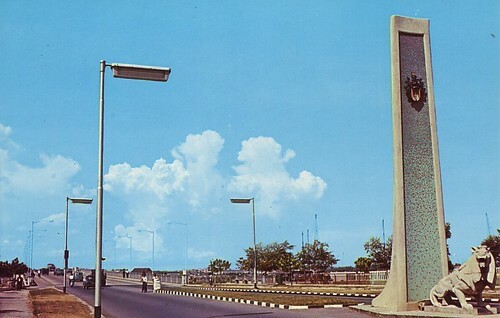 Not many people nowadays talk about this Bridge. It’s not mentioned for quite sometime and even I also have to ‘rewind’ my memory to recall where is this Bridge haha. 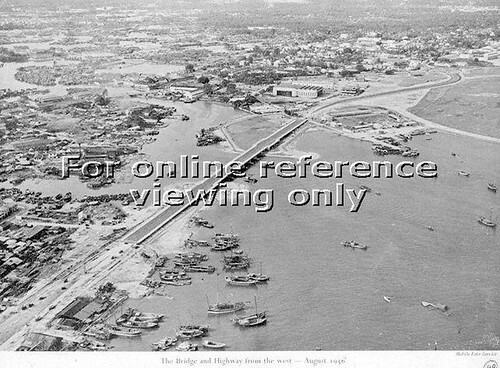 The younger generation may ask where exactly is Merdeka Bridge in Singapore? 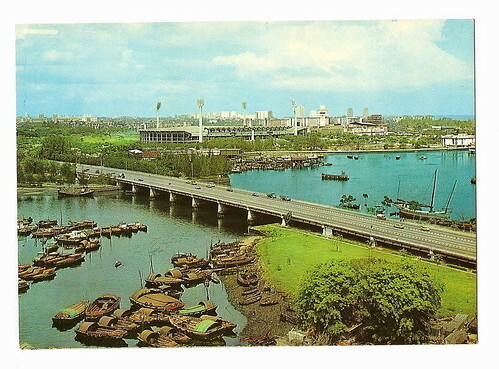 In the 50s to 70s, this bridge was commonly known as 独立桥 (Independence Bridge) by the Chinese. ‘Merdeka’ is a Malay word which means Freedom or Independence. 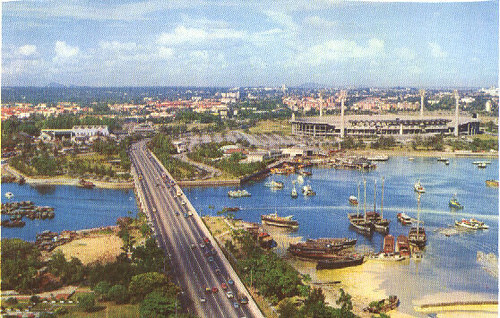 In fact from 50s to the 70s, Merdeka Bridge was mentioned frequently by the people. As time goes by especially in the late 80s onwards, Nicoll Highway was mentioned instead of Merdeka Bridge as Merdeka Bridge is just part of the Nicoll Highway. Where is this Merdeka Bridge then? This Bridge crosses the mouth of both the Rochor River and Kallang River. This Bridge was built in 1955 by PWD (Public Works Department). It was named Merdeka probably to symbolise the people’s pursuit and spirit for independence. The bridge was constructed to link two stretches of the then new Nicoll Highway. It was built at a cost of $9,500.000. It was declared open by the then Chief Minister Lim Yew Hock on 17 August 1956. 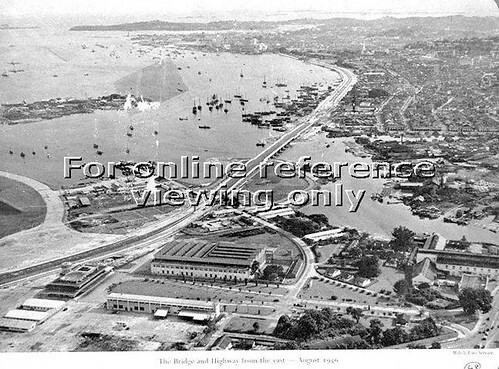 It was the longest prestressed concrete bridge in South East Asia then (mid 50s). So why is this Bridge built then? 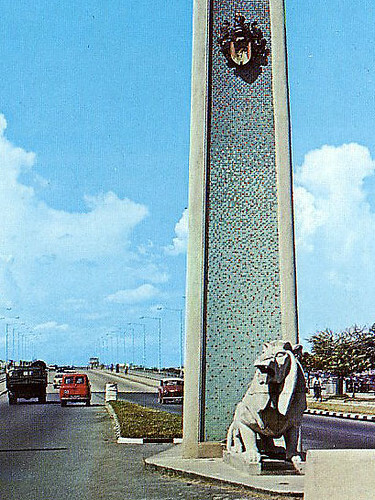 It was built to ease the traffic congestion during peak hours at Geylang Road/Kallang Road then. It was part of the Nicoll Highway which the bridge linked. It should be 50 over years old by now. 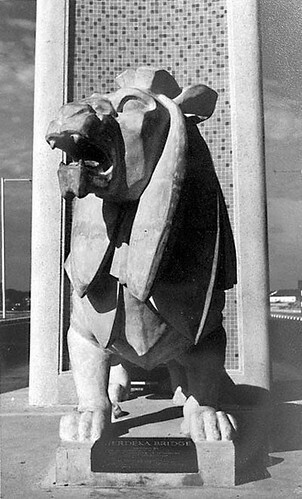 The main icons of the Merdeka Bridge should be the 2 Stone Lions guarding each side of the bridge. They have since been removed, first to Airport Road, and are currently placed at the SAFTI Military Institute in Jurong. Note : You may wish to take note of the street lights design on the bridge was totally different from now. 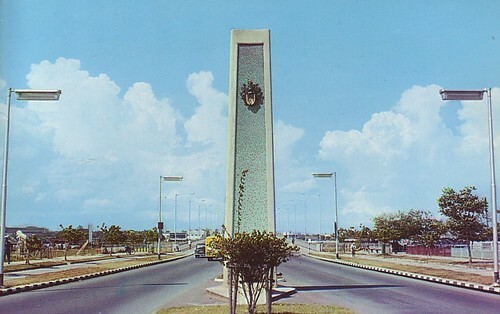 Merdeka Bridge was also known to be “lovers corner”. 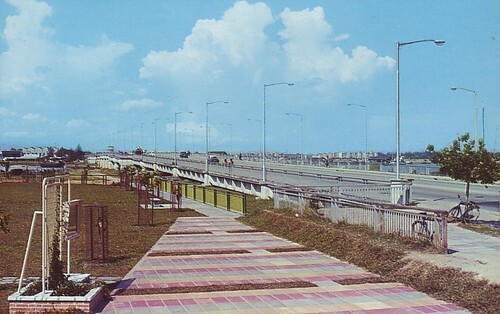 The stretch of Nicoll Highway facing Tg Rhu and close to the bridge was where wooden tongkangs were built. Before Nicoll Highway was widened it comprised a narrow stretch of land called “The Esplanade” all the way to present-day Suntec City. Here courting couples used to hold hands and look at the tongkangs. Beach Road facing Nicoll Highway was still an empty piece of grassland saved for the St John’s Ambulance Bdlg and Satay Club. There was also a reversible lane in the middle of Nicholl Highway then. In the mornings, the lane is used for city-bound traffic, and in the evenings, for home-bound traffic. I remember mobile squad TP officers manning the gates and switching the traffic around at those times… quite a sight to behold. Also, I wonder if my understanding is correct. Merdeka Bridge was built by the British as a token in exchange for Christmas Island, which used to belong to Singapore – this is what my parents told him long ago. Do you know if this is true? 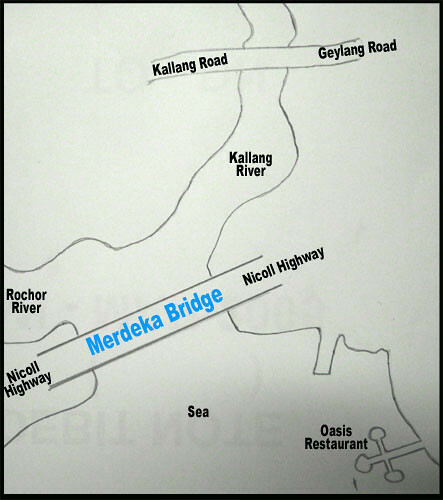 Merdeka Bridge was mentioned in the Nicoll Highway collapse a few years ago. The bridge was sawn off (disconnected) from the affected part of Nicoll Highway as a precautionary measure, so that further collapse of the unstable highway would not cause any damage to the bridge. I actually took several photos of this bridge last year with the intention of blogging about it. You did not mention the old building next to the Nat Stadium car park and beside the bridge that was used for the Netball Association for a time. It looked like a typical bungalow by the sea. That building was a look-out tower for aircrafts landing at the Old Kallang Airport. STill there opposite to some police post. If one believes the politicians of the day, then every said about Lim Yew Hock must be true. The definition of “belong to Singapore” must be clarified because many of my parents’ generation thought it so, again blame it on the politicans. From the released British Record Office documents, Christimas Island was “administered from Singapore”. It was transfered to Australia because the largest phosphate company on the island was an Australian company made appeals to the Australian Government. The company wanted the protection of a country “far larger than Indonesia” (Read the present political tension that off and on occur between Indonesia and Australia) and for this reason Australia was a suitable candidate. Singapore at that time was a colony of the British and if Singapore were to take up the challenge, then it would not have been possible because it was a colony. The obvious responsibility would have fallen on the british Government but if you will remeber the British Stirling suffered a major devaluation in the 1950s. This prompted the British to find creative ways to still hvae a presenc ein the Far East, yet at the same time need not be burdened with a hevay budget. Daddyto3, you are right. That Highway with reversible lane! It’s really a hassle having to station the police to change the direction. Victor, thanks for the input. Hi Chun See, I think I must check that out. Thanks for this post and the pictures that came with it. It was fascinating for me to learn about how the locality around Merdeka Bridge has transformed over the years. don’t notice this. You must proceed your writing. I’m confident, you’ve a great readers’ base already! transfers, video and audio downloads, games and much more. We have observed that the windscreen mount car phone holder functions well in many circumstances. Firstly thank you for all these nostalgic articles. I was born in 1949 and lived near Merdeka Bridge. I remember walking on top of Crawford Bridge which is near by and caught my first catfish with a line thrown over Merdeka bridge when I was 10 years old (1959). I lived near the corner of Crawford St in North Bridge Road. Some houses do not have toilets. We used the public toilet in the middle of North Bridge Road. Now I live in comfort in Australia and still working in IT as software developer. How times have changed – am I your oldest reader?